You wanna be cool, don’t you? Nothing says health insurance like doing a keg stand. This must have been the conclusion reached by the ad department folks at Colorado’s health insurance marketplace, Connect for Health Colorado. 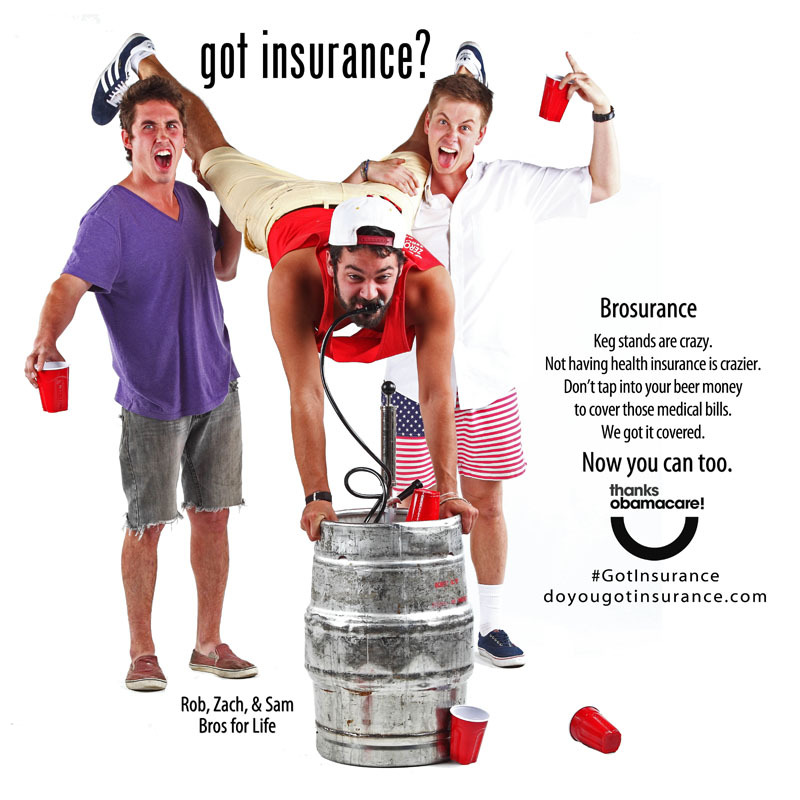 In a last-ditch effort to garner some much-needed street cred with the nation’s twenty-somethings, Colorado’s marketplace has decided that featuring an image of frat boys performing a keg stand will somehow entice young people into buying health insurance. “We were really trying to come up with something fun and creative that would cut through the clutter on social media and create awareness,” Adam Fox, the director of strategic engagement for the Colorado Consumer Health Initiative, told the Los Angeles Times, ignoring the fact his “creative” ad campaign is predicated on a 1993 ad for milk. “We wanted to inject a little bit of humor and have it be fun and have it catch some attention — and sometimes you have to push the envelope a little bit to do that. The idea is really to help those populations realize they have some options,” Fox said. Brosurance is the rage today! Regardless of who you are, we want you to #GetCoveredCO! “Brosurance is the rage today! Regardless of who you are, we want you to #GetCoveredCO!” a tweet from Colorado Health Op pitches. The ad is one of a slew of new social media spots designed to provoke young and healthy people into signing up for insurance, a key market the federal government says is essential to lowering premiums for everyone across the board. However, even if someone figures out a decent way to tap into the wallets of college students – who, with student loan repayments, are likely already strapped for cash – it’s highly unlikely anyone’s premium will lower. As we reported earlier, a hidden spreadsheet found on healthcare.gov, which at one time was available publicly but has since been buried, displays premium rates for every state and county across America, and they don’t seem to be getting any lower. It’s probably also unfair to target the college crowd with such a superb ad campaign, a section of the population we have demonstrated will sign up for just about anything as long as it’s presented as a means of supporting Obama or his healthcare initiative. The fictional narrative of “the more people sign up, the lower costs will be for everyone,” is delusional at best, and makes the marketing of health insurance as a trendy, cool and hip thing that you can laugh about with your beer buddies truly laughable. The stench of desperation is pungent.